Author, speaker and head of the missiology department of Morling College, Michael Frost, taught a breakout session on his ‘BELLS’ method of living a Christian life. “Live a life worthy of your calling,” the apostle Paul urged Christians at Ephesus. Those words were at heart of the Axios conference in Parramatta. 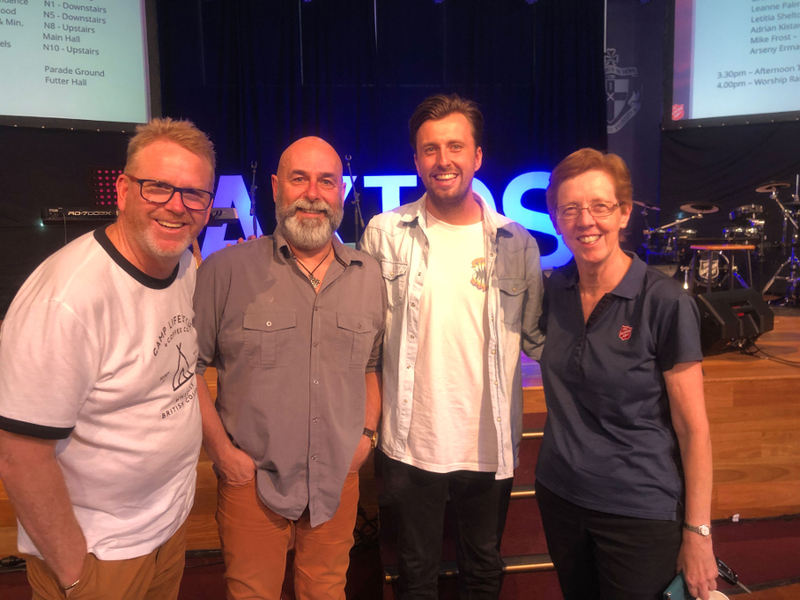 Held at the Kings School from Friday to Sunday 26-28 October, delegates from all over Australia gathered to better understand and learn how to put into practice the call to be God’s holy people in the world. Opening the conference on the Saturday morning was Sophie Renton from McCrindle Research, who gave a powerful overview of the way Australians had changed over the past decade, based on McCrindle’s social research and census data. While more and more Australians were identifying themselves as having “no religion”, she urged Christians not to be dismayed. “We need to learn how to work within this new context and bring Jesus to people where they are,” she said, and emphasised that Christians needed to be “real, relevant, responsive and relational” in order to reach Australians in the current culture. Major Beth Twivey (left) and Lieutenant Belinda Zhou were attendees. 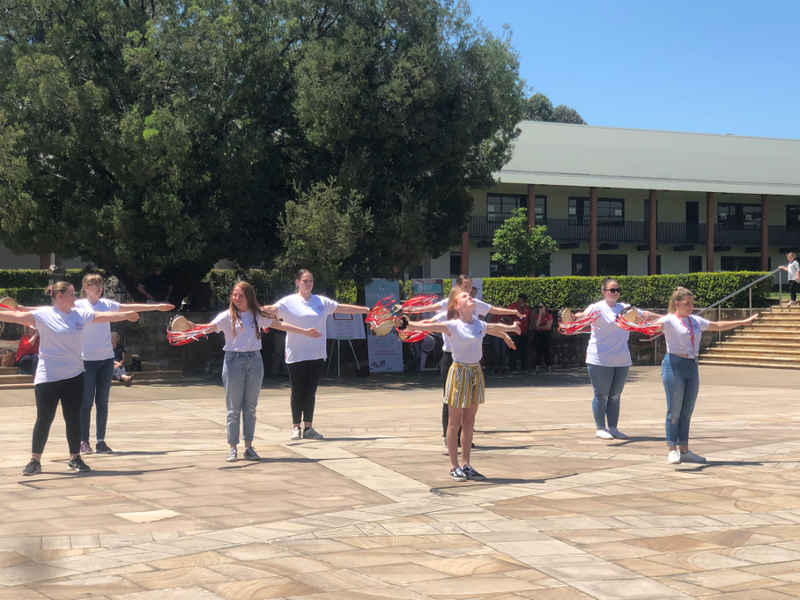 Parramatta soldier and one of the Axios organisers, Richard Eden, said hearing speakers like Sophie Renton and applying the learnings were key if Salvationists wanted to remain relevant. “As a Salvationist living in 2018, it’s really about trying to find the heart of what it is to be a soldier,” he said. “A lot of the work that’s done now is done by professionals, but as soldiers, really, what’s our calling? Parramatta Corps Officer, Major Grant Sandercock-Brown, said if each of the delegates at Axios gained empowerment to step into the life that Jesus called them to, lives would be transformed as a result. “Our hope is that something speaks into their heart and God reminds them or prompts them ... it could be a specific skill, it could be an affirmation about their journey that they’re already on,”he said. Speaking to a breakout session on “Missional Holiness”, Major Sandercock-Brown said that it was the presence of God in Christians that made us holy, and that the presence of God pushed back the darkness in the lives and communities in which we lived. In a sense, Major Sandercock-Brown explained, as he walked participants through the gospels, mission was holiness. It’s the light of God in the lives of Christians who “take the contagious holiness of God into our relational networks, friends, family and workplace”. Another keynote speaker was Michael Frost, international speaker, author and head of the missiology department of Morling College. He challenged the 21st-century method of evangelism, saying that Christians have “lost the idea of how to share faith ... it’s boiled down to: befriend somebody and invite them to church”. Michael said that most evangelism strategies only dealt with the sin, guilt and atonement part of the gospel. While acknowledging that this is a vital part, he told those gathered that it was far from the whole gospel and that Christians needed to be better equipped on how to explain what the powerful, life-giving presence of Jesus in our lives actually meant. “The church is meant to be a sign and an instrument and a foretaste of what is to come,” he said. But he believes that it has settled for conformity. “If nobody is asking you any questions about your faith then your life doesn’t look different enough,” said the author of the book, Keep Christianity Weird. He went on to explain how living a countercultural lifestyle with his church, “Small Boat, Big Sea” in Sydney’s northern beaches, naturally prompted people to ask questions about life and faith. By blessing three people a week, eating with three people a week, listening to the holy spirit, learning from Jesus and recognising that they are a people who are “sent” by Jesus, the church, Michael says, is bringing the Good News to people in their neighbourhoods. Other speakers at Axios included Letitia Shelton, founder of City Women Toowoomba, an organisation with 15 ministries reaching out into the city to help women and girls; Lieutenant Frank Wang, Corps Officer at Bankstown who spoke on making disciples; Leanne Palmer who has worked with the Scripture Union and World Vision and spoke on being “Grandparents of Godly influence”; and Adrian Kistan from The Salvation Army’s Multicultural Ministries Team, who taught on mission and ministry in a culturally diverse Australia. Ryde Corps Team Leader Greig Whittaker, author Michael Frost, Aaron Campbell and NSW/ACT DC, Lieut-Colonel Miriam Gluyas. 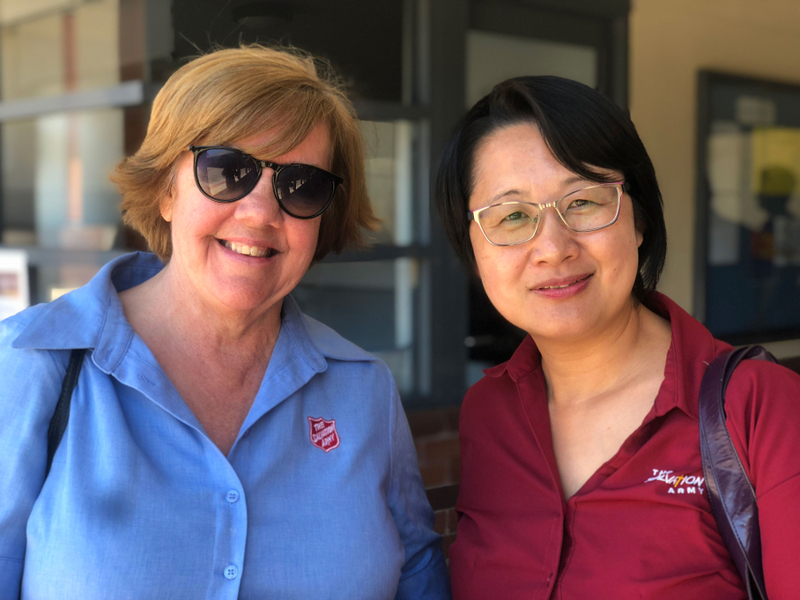 Major Sandercock-Brown said The Salvation Army in Australia was in a unique moment of time to see past the structural, organisational complexity and to ask itself if it’s really serious about engaging Australians with the Good News of the Gospel. “Do we seriously want to grow our faith communities?” he asked. “Does that matter to us? Or is it enough just to kind of make some plans that we hope will work?